As most of you know I am recovering from my own battle with ED and today I want to continue the conversation about anorexia, bulimia and exercise addiction to help those readers who may be suffering. According to this USA Today excerpt, addictive personalities tend to gravitate toward athletics. Kimiko Soldati, a 2004 Olympic diver who struggled with bulimia captured it best when she said “It would be hard to find a female athlete in the aesthetic sports — gymnastics, diving, cheerleading, figure skating, dancing — who isn’t preoccupied with body image and somewhat obsessive about what she is eating.” While running isn’t necessarily an aesthetic sport, I think this holds true for many of us too. What drives runners to take such extreme measures in the first place? Do lighter athletes run faster? Temporarily, some might. This happened to me when I first started restricting a few months before the Cleveland marathon and ran my personal record there. But the intensive strain of running requires an ample flow of caloric fuel, and after the shock wears off , the body gets smart. The body will start eating away at muscle once little to no fat remains. Long-term effects of starvation start to set in, and running faster becomes a thing of the past. The body is an amazing thing, and it will shut down other functions to focus on the things that really matter: like keeping the heart beating. Long-term effects can be detrimental, placing extreme stress on the body, with imbalanced electrolyte and potassium levels for binge-purgers and supplemental low heart rates and irregular heart beats, which can be lethal. Luckily, once in recovery, most damage is reversible. Recovery from full-fledged eating disorders can take years, and unfortunately, recovery is not an easy thing. According to Dr. David Rosen of the University of Michigan, eating disorders kill more people than all of the other mental illnesses combined, including depression. You might be thinking to yourself: this post is definitely not for me; I’ll never have an eating disorder. But, I encourage you to keep reading. Back in 2005, my behaviors started slowly, where I only ate certain types of food or exercised a bit more than usual. I thought nothing of it. Unfortunately, my motive to “lose just a pound or two” to run a little bit “faster” turned into a full-fledged eating disorder about six months later. The habits became intense and hard to break. While not all disordered eating leads directly to an eating disorder (definitely not), almost all eating disorders start as disordered eating. For female runners, it’s a really fine line that can be straddled daily. 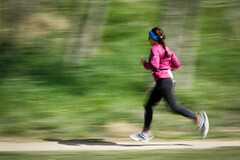 Running, after all, leads to a lifestyle of focusing on health, including healthy food. When being conscious of healthy choices turns to an obsession, though, a problem may be on the horizon. As eating disorder expert Patricia Kaminski of the University of North Texas says, “The more competitive people are, even if they’re just competitive with themselves, the more likely they are to have the kind of extremist thinking that can lead to disordered eating patterns. If running five miles is going to help me train well, then running 10 is better. If a 1,200-calorie diet is good to help me lose weight, then a 500-calorie diet must be great.” Have you ever battled with these type of thoughts? From mild to extreme, disordered eating doesn’t mean you have a full-fledged problem; however, if taken to the extreme, a problem may start developing. Nip it in the bud! If you’re experiencing any of these symptoms (of course, I’m not a registered dietician or anything of the sorts…but my personal experience says…), please talk to someone! I’m always on or off a diet. I spend most of my day planning out my food. I make a lot of food for other people but will usually not allow myself to eat it. If I miss a work out, I feel like I can’t eat as much. I don’t trust myself around food. I know if I eat normally, I am going to gain weight. I get really anxious if I miss my usual run. I feel fat on a regular basis. I’ve cut out a lot of foods (starches, fats, sugars, carbs) in order to eat “healthy.” I stick to safe foods like fruits and veggies. I weigh myself daily, and the number determines my mood. I’m constantly thinking that I’m not thin enough. It’s normal for both men and women to have occasional negative thoughts about their bodies. It becomes troublesome, though, when it gets obsessive and such thoughts rear their ugly head on a daily basis. When I’m not able to go out and pound some pavement, sometimes I still turn to the destructive behavior of restricting, especially when stress is high whether at school or at work. It took me many years to truly admit that I had a problem. Such is the usual story of most people with eating disorders. We whisper about it and keep it hush hush; we rarely want to discuss it in public. We deny it. But, all too often, this dirty little secret is too close to home to female long-distance runners. More pro-athletes and public figures have come forward with such struggles as of late, in the hopes of raising awareness and erasing the stigma that eating disorders are self-inflicted and selfish. I think it’s working and am hopeful that this trend of striving for extreme thinness dissipates. Have you or another runner you know suffered from an ED? Next Real Runners Don’t Take Walk Breaks. Or Do They? I am suffering from it now, and have been for years. I read your check-list, and I can check off at least 7 of the 11. Every day is a struggle. When I was a child, my parents allowed us to eat whatever we wanted. My older sister, who was “naturally” thin, could eat an entire box of peanut butter bars and a gallon of milk at one sitting and still maintain her size 3 figure. I would restrict fat or calories or food in general and wore a size 11. Now I am at a normal healthy weight (and have been for 10 years thanks to my running habit and penchant for “healthy” foods.) But it’s never enough. If I am being completely honest with myself and you- I am so afraid of going back to where I came from. I am always giving up something- be it sugar or dairy or gluten… and I never feel like I am going to get off this roller coaster. Whenever you think of someone who is suffering from this, you picture a super skinny girl who thinks she is fat. I am not super skinny, and I don’t think I’m fat. But I sure am afraid of going back to where I was. I was about 15 lbs heavier and 3 sizes bigger before I started running and I sure as heck don’t want to go back there (other than during the post-partum period of course!) I prefer being a lean mean running machine. It’s what makes me happiest when it comes to my body. But it’s not just my weight or the size of clothes I can wear or my appearance. It’s so much more. I feel better when I’m lean. I feel more energetic, stronger, healthier and more like the me I was meant to be. I prefer it. So I too am motivated at times to continue exercising or watch what I eat to maintain the body I want. But I really don’t think that’s an intrinsically unhealthy attitude. That being said, I generally don’t obsess over food or count calories. I don’t really restrict at all, other than trying to eat as healthy as possible. If I do start counting calories I easily get sucked into obsessing about it, so I just don’t do it and trust that my lifestyle will take care of it. Maybe I could even get leaner that I do just from training and eating the way I want to, but it’s not worth the sacrifices and the risks of going into ED territory for me. Sorry for rambling on, but I just wanted to say that I can relate to a lot of what you’re saying and that some of what you’re experiencing may be normal and some might be disordered. If it’s the latter, I hope you find the help you need to avoid the full blown ED! Thanks so much for being so honest and open about your struggles with body image! I really appreciate your honesty in your post. It’s definitely a slippery slope and hard to catch it when you fall back into destructive behaviors. What has worked best for me is to keep regular appointments with a dietician (for the physical health) and therapist who specializes in eating disorders (for the mental health). Being honest with you and myself, I’m not the best at keeping regular appointments, especially when I think I’m doing just fine, but I know in my heart that they need to happen. I totally understand your comment about stereotypes of eating disorders and not thinking you “look” sick enough to be classified as having one. I can tell you, though, when I was at my sickest, I wasn’t at my lowest weight. It was after several years of being in the behaviors, when my body started to rebel (ie metabolism slowed down and held onto every calorie it could), that the long-term effects really started to set in. My heart beat was abnormal, my electrolytes were imbalanced, my blood pressure was extremely low and I was beginning to form osteoperosis, all while being classified as “normal” according to the BMI scale. I’ll be thinking of you and pulling for you. I can relate to many of these comments, although I find this one to be an especially important one–we need to be aware that those who are even at a “healthy” weight can suffer from eating disorders as well. Even at my lowest weight I couldn’t be considered “sick” enough physically to have an eating disorder, although the mental side of things were continuously going downhill. Thanks for opening up and sharing your experiences. It must be tough, but you are doing a great thing by writing on this topic and serving as a role model on how someone can cope, focus on recovery and learn to love themselves. I have never suffered from an ED, but I have started down that path a few times–definitely could check off most items on that list above. Fortunately, something has always smacked me off that path. I think we all struggle with body image since we are bombarded with ideas and images of what we all should look like, not how we feel on the inside. Best wishes! Thanks to Sarah and Vanilla for the additional comments! Sarah – so good to hear that you are in full recovery and have made it a priority to continue running for only the right reasons. That’s definitely something that has been a struggle for me initially – I used to use a GPS that included calories burned per run. For now, I know this is a trigger and negative influence for me, so I don’t use it. Perhaps, one day, I’ll be able to focus more on numbers, but right now, it’s not a good idea! Vanilla – thanks so much for the encouragement. Looking back at that list,pre-disorder years, I would still be able to check off several of the items, too. The difference, though, is that I wasn’t obsessed and over the top! It’s strong women runners, like you, that inspire me to continue the path toward complete health, both mentally and physically! This is a brave post and useful as well. I think I have a relatively healthy attitude to food – as healthy as any woman’s attitude ever is. But I know my weaknesses and the dangers. I weigh myself every day, and a few years ago this had a BIG impact on my mood. Luckily I caught this in time. But unfortunately my body image is too closely aligned to whether I’m thinner or heavier. Running has been good for changing that – my ‘sturdy’ thighs finally look good in my eyes when I’m in running shorts. I can relate to Amanda’s fears around the past. My childhood was similar with a sister who could eat anything and never thought much about weight. I, on the other hand, was chubby. As a teen, I started dieting, and by age 14, I had full-blown anorexia. For 20 years, I struggled hard with the illness. Like Ginkgo, I had success initially, getting faster despite restricting. There a grace period, but it doesn’t last. The illness nearly killed me, but I did eventually recover. I think it’s really important for other to open up and share their experiences, so I’m really glad to see others doing so here. Thanks, Lize! I am so glad you’ve been able to recover and that you are also sharing your experiences. It’s such a complicated disease – how it manifests itself in each person and the outside forces that are often at least partially to blame for it starting to begin with – and hopefully if we keep up the open dialogue and ask tough questions we can help young women nip the ed in the bud sooner or avoid it all together. What a very well-written post! You address all the critical issues surrounding eating disorders among athletes; I completely agree that we just need more people to speak up about it! I’m 22, running my first marathon in 2 months and really worried. I’ve had issues with my food for years but lately it’s got really bad – I currently live alone and, with a busy schedule, I try to avoid eating around others – always packing a tiny amount of lunch that doesn’t fill me up. After a longer run (15-30km) I’m so exhausted that I struggle to do any work the following day. As someone who is 5’6″ and 120lbs, I suppose I look fine to most people, not too skinny/too fat but I’m so preoccupied with how bulky I feel. I struggle to eat well because I’m scared if I do exercise afterwards my legs will get even musclier than they already are. My situation is distracting from my studies and making it difficult to meet friends for drinks or meals. Do you have any suggestions? First, thank you for your vulnerability and opening up like that; it’s a good sign that you are able to realize that the focus on food and restricting is becoming an unhealthy habit. So much of what you wrote reminds me of myself a few short years ago – keeping busy as much as I could to avoid food, running to the point of exhaustion and not re-fueling my body, and avoiding social gatherings so that I didn’t feel pressure to eat (eating around others is still a point of anxiety for me). I usually felt the same in terms of looking ‘fine’ because I never got alarmingly underweight (at least my eating disorder always told me that) but I was actually sickest when I wasn’t even at my lowest weight. The best advice that I can give (and wish I would have had this advice when I first starting slipping badly into anorexia and bulimia) is to go and talk to a professional. I know it might sound scary…but just becoming open about it and getting your thoughts out in the air…it can be tremendously relieving! I ran many a marathons without proper fuel and it can be terrifying. Bonking and getting dizzy spells can happen….I’d highly suggest going to see a nutritionist before you continue with the training and the racing! Just to see what a ‘proper’ day of nutrition looks like might be eye opening! I’ll be pulling for you and hope that this might help! You need to get help from people in the healthcare-system that have knowledge of what you are struggling with. Do it now! Don’t wait. You need help. And I am not saying this to be mean, but because I want what is best for you. I certainly hope u never ran that marathon… Good luck and get stronger! Hi, Ive been reading all the comments on here about running and eating disorders and wondering if anyone can relate or has conquered the separation of the love of just running, but competitively too but not letting their fear of weight/body image be tied in with it. I have been struggling off and on since age 14 and am 36. There were periods where I was a normal weight, only because I was forced to and was not allowed to run if I dropped below a certain weight. This of course was when I was younger and ran in high school and college. I have always had a treatment team but have been in and out of treatment, therapist after therapist. I hate how my anorexia and (exercise bulimia-I guess you call it) get tied with my love of running. I hate how I struggle with wanting to have the perfect distance runner body I call it and always am comparing/getting triggered by fast thin runners. I have also at times been at normal weights as stated above but engaging in purging and purging through my running. My hope is that one day they can be separated and that I can recover completely in my eating disorder. I am at rock bottom low, lower than I have ever been as an adult right now and in treatment trying to pick myself back up but of course terrified. I always have been told in treatment centers that my running and ED are too tied together and that I simply cant have running in my life. This I cannot imagine and is too painful. I started running with my Dad and it gives me peace/a sense of accomplishment. Right now, where I am thankfully they say that I will be able to run again but not for a long time, till I can work through things, get my body to a healthy place. My head tells me I am not too thin and would want to stay where Im at even though where Im at is difficult. I know I have to accept that I will never be accepting of my body at any weight however low. Running is a joy in my life and I want it separated from my eating disorder but I dont know how to do it yet. Can anyone relate or has anyone conquered it. Its so hard. Hi, lost runner! I literally was just having this conversation with my husband yesterday morning as I sat on the couch struggling to decide whether I was lacing up my running shoes because I WANTED to go hit the pavement or because my eating disorder voice was telling me that I HAD to go hit the pavement. I’ve struggled with eating disorders on and off since the age of 20 (I’m now 31) and I have been a runner since the age of 12. Before the eating disorder, I always ran for the right reasons. I never thought about what I had eaten, how many calories I needed to burn, my weight…you know, all those eating disorder thoughts. In 2010, I had gotten really bad and my anorexia and bulimia had taken over my life. My entire identity was wrapped with my eating disorder and running was a constant chore that didn’t involve any joy whatsoever. I went to inpatient treatment later that October after having an ‘a ha’ moment at mile 25 of a marathon when I literally began seeing double and had to sit down because my nutrition was so awful. It took that moment for me to realize that running was feeding into my eating disorder. I’ve been in active recovery since January of 2011 (don’t get me wrong, I still have my ups and downs) but have to be very cognizant of running. I can still become obsessive and honestly I don’t know if running will ever be completely unrelated to my eating disorder. I’m definitely getting closer to that point though and I know others who have gotten there. I think there is hope for us! I can still compare myself to others quite critically, just like you had mentioned above. The racing environment sometimes can be a trigger for bad thoughts. I have to hold myself accountable and take breaks from daily running to make sure I’m being true to myself and not my eating disorder. When I was in treatment, my therapist had me write a note to my running shoes as an exercise to reflect on why I needed to take a break from the running, at least at that point. I’ve copied it below in case it might help you reflect on where you are at this time. I truly understand how hard it is to comprehend life without running, but sometimes a little break is just what the doctor ordered. Hang in there! With mourning and lots of sadness, I write to let you know you’ll be sitting in the closet for a bit. No more long strides on the sunny trails of Columbus and no more sprinting to the finish line on race days. This, however, is just a little hiatus and bump in the road. Nourishment, rest, recovery and rebuilding of the body, mind, spirit and soul after endless days of pounding will certainly result in renewed passion of our runs together. I could tell you were tired, too. Not so spunky, a little worn down and not such a spongy sole of support. Not the joyous strides you were once the foundation of, but rather the constrictors of feet tired and weary of running the same route day after day, monotonously, robotically and regimented. When I return, renewed and refreshed, you’ll be laced for adventure, joyous and scenic voyages with plenty of energy and bounce in the step. Paced with perfection and armed with happy feet. Thank you for this post! As an NCAA D1 runner, I see this becoming more and more of an issue that is not being spoken enough about in the sport of female distance running. My friend and I started a blog called StrongRunnerChicks for female runners, especially college/high school/competitive, to contribute advice, tips, and stories to our site! I am a big fan of your blog and noticed that your purpose/posts really align well with our vision. We’re a growing group of girls & young women dedicated to fostering strength in the female running community. From beginner high school runners to top collegiate NCAA athletes to runners that deadlift twice their body weight, we’re accepting of all body types, running routines, and eating habits, and proving that you don’t have to fit the mold to be a female distance runner. Strong Runner Chicks started as a way to inspire female runners to embrace their strength rather than cover it up; to embody the curves, muscle, and female bodies that we were given; to foster strength in the female running community and connect females of all ages, competitive and recreational runners alike, to an online space where we share ideas, tips, and personal stories on topics related to running, racing, strength training, fueling right and defining what it means to be a strong runner chick. My sister has an eating disorder and she has become obsessed with running running longer and longer distances every week. She runs 50+ miles a week at the age of 46 with an eating disorder. She has become very thin to the point her bones I her chest protrude. If I say anything she will stop talking to me.